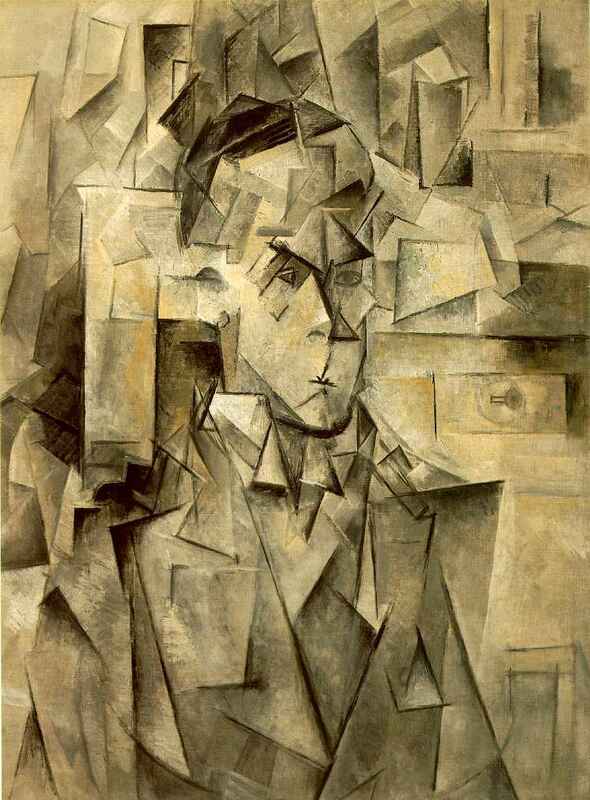 The object dissolved in the unity of consciousness: Pablo Picasso, Portrait of Wilhelm Uhde, 1910. Oil on canvas, private collection. ‘No doubt the wisdom of the artist may be the guide of the work; it is sufficient explanation of the wisdom exhibited in the arts; but the artist himself goes back, after all, to that wisdom in Nature which is embodied in himself; and this is not a wisdom built up of theorems but one totality, not a wisdom consisting of manifold detail co-ordinated into a unity but rather a unity working out into detail.’ Enneads V.8.5. The ‘faceting’ of ‘Analytic Cubism’ could be interpreted as depicting the ghostly, fragmentary nature of material existence at the same time as seeking to evoke the second hypostasis, Intellect. But how are you to see into a virtuous Soul and know its loveliness? Withdraw into yourself and look. And if you do not find yourself beautiful yet, act as does the creator of a statue that is to be made beautiful: he cuts away here, he smoothes there, he makes this line lighter, this other purer, until a lovely face has grown upon his work. So do you also: cut away all that is excessive, straighten all that is crooked, bring light to all that is overcast, labour to make all one glow of beauty and never cease chiselling your statue, until there shall shine out on you from it the godlike splendour of virtue, until you shall see the perfect goodness surely established in the stainless shrine. Plotinus’ Enneads are built on contemplation. Its practice enables Soul to rise to Intellect. Inseparable from the notion of will, contemplation is the self-directed and self-contained thought of the higher realm. For Plotinus contemplation, thought and life are synonymous. They are most true and perfect in Intellect. The contemplation of Ideas is above the contemplation of images and the contemplation of the Good is above the contemplation of Ideas. Plotinus wrote of ‘creative contemplation’.4 Contemplation is perfect creative activity, and the latter occurs spontaneously when the former is entered into. In its activity, contemplation creates what is contemplated – from the weak and dreamlike contemplation underlying creation by Nature to that by Soul which in its contemplating (since it is more complete and therefore more contemplative than Nature) gives birth in a way and to a product superior to that of Nature. Plotinus proposed a method for ‘dematerialising’ by contemplation the visible universe comprised of separate elements in order to ‘see’ that of the spiritual intelligible in which all elements have no perceptible shape, magnitude, temporal or spatial difference – since each is all, and all, though distinct, are an infinite one. Everything that exists and happens in the higher universe has its poor copy in this one – objects in this universe are the replicas of Forms in the other, physical reason the replica of contemplative reason, physical sight the replica of the vision of Intellect, physical activity in the creation of an object to be seen with a vision limited to the sensation of that object the replica of contemplative activity in the creation of an object which enables vision. One acts in and engages with this world because one’s capacity for contemplative activity, for vision, is lacking. In Intellect, through contemplation, the subject’s thought and the object of desired knowledge (that is – being, itself the product of contemplation) have identity as self-living sight and real substance, as the partless essence of what is, complete within itself. Contemplation and living Being unite in Intellect as truth, beauty, eternal life and vision. The life (activity) of ‘Mind’ is far superior, far more vital, creative and real, than life in this world. This entry was tagged Aristotle, contemplation, Friedrich Nietzsche, Henri Bergson, mysticism, Neoplatonism, Pablo Picasso, Plotinus, the aesthetics of self, The Enneads. Bookmark the permalink. Here is my comment, Phil. I believe we all are reflections of the Creator. The illusion is, we don’t know it because of the maya that is found in this realm. So when a person contemplates who he is and begins to recreate himself into that form which he truly was made to be, that is where illumination comes in, a real grasp of self-power. We chip and we carve and we throw away what is no longer needed, diving deeper and deeper within in order to find our True Essence. This has been my Path for many years, seeing through the lies and deceptions in order to arrive at Truth’s Door. And then to fashion myself into that Truth, and not what others have told me Truth is. …Eternity is majestic thing…identical with the God… ❤ it! thanks for your sincere comment – and I really liked your latest post on less is best. Beethoven made the same point – and he composed the 9th symphony!